Due to a risk of its detector detaching and falling, the Millennium Nuclear Medicine System devices have been recalled by manufacturer GE Healthcare. While no patient injuries have been reported, there was an incident where the top detector detached and fell onto the detector below it. The U.S. Food and Drug Administration considers this a Class I recall, which is the most serious level of recall. 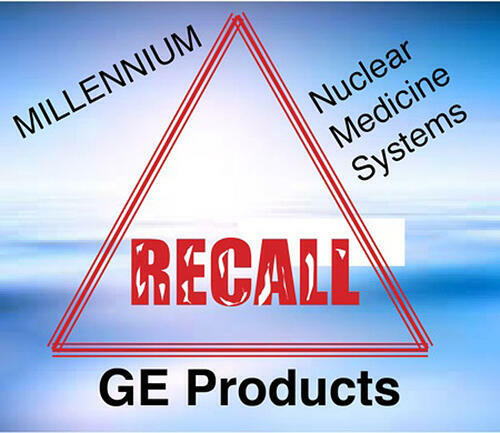 Millennium Nuclear Medicine Systems affected by the recall include the Millennium MG, Millennium MC and Millennium Myosight Nuclear Medicine Systems. The Millennium Nuclear Medicine Systems are used to take images of a patient’s organs or tissues to help diagnose or treat a disease or health condition. Users were warned to stop using the devices until GE Healthcare inspected all systems, which was completed by November 6. Nine hundred ninety-six devices were recalled including the following model/item numbers: NMH 800, 801, 802, 803, 814, 815, 816, 817 and NGS00, 005, 009, 012, and 014. The experts at GE Healthcare determined that the isolated incident was cause by a motion stopper that improperly functioned, as well as a missing mechanical stopper. A GE Infinia Hawkeye 4 single proton emission computed tomography/computer tomography scanner fell during a scan in 2013, killing a patient. The nuclear imaging cameras weigh more than 1,300 pounds because of its lead-lined internal collimation system. The incident resulted in a Class I recall of several nuclear imaging systems so they could be retrofitted with additional support. If consumers or healthcare professionals witness quality issues using these devices, they should be reported to MedWatch: The FDA Safety Information and Adverse Event Reporting Program, as well as to the facility. At Atlantis Worldwide, we constantly monitor equipment recalls, product launches and more for the benefit of our valued customers. If you are in the market for a CT Scanner, Nuclear Medicine System, C-Arm or MRI, be sure to talk to the experts at Atlantis Worldwide to see if a used or refurbished model could fit your facility’s needs. Contact Us Today!